St. Louis Cardinals Opening Day Starter: Lance Lynn? 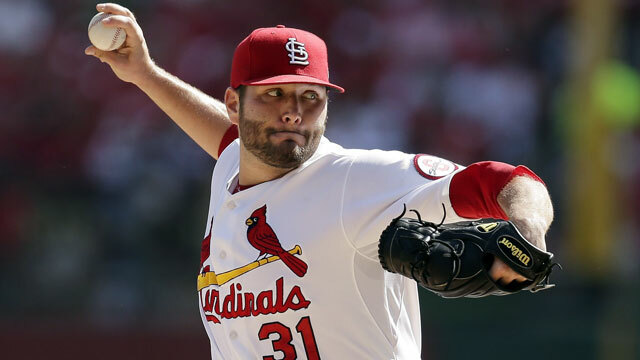 With Adam Wainwright‘s injury, there’s a chance that Lance Lynn will be our opening day starter. A few thoughts on that. 1) While Lynn is still young, he’s a three time 15 game winner who’s pitched in the post-season every year since 2011. He’s not some inexperienced rookie who’ll crack under the pressure of starting versus Jon Lester on opening day. Some people argue that since he’s young, he’ll be nervous. I say the aforementioned 3 years and playoff experience will eliminate that. Sure it’s Wrigley against a revamped Cubs team that’ll have the place loud and boisterous, but that’s not any different than a playoff road game. 2) Lynn made a leap last year, dropping his ERA by a run, and his BABIP was .293, lower than the year before .321, but not drastically so. It seems to me that Lynn simply continued his evolution as a starter. This is, of course, assuming Lynn stays healthy. He’s been durable, pitching at least 176 innings for the past three years, so it appears he’s durable. The minute you say that though, somebody’s elbow blows out. So I’ll keep quiet. In the end, I think Lynn will be fine if he has to pitch on opening day. I’d prefer Waino be around to do it just because he’s Waino, but Lynn isn’t a bad plan B.